As promised ladies and gents! Mole from the Motherland. This recipe is one that my suegra uses to celebrate anything that needs celebrating. And today is Jose and my 5 month anniversary so I think that is worth celebration. Bring on the mexican comfort food! I used frozen chicken because, well, that’s all that was in the store. So I thawed it and then boiled the chicken. As you boil it the water is made into broth. Do not throw this away because you will need it later on. We now get to the goods. CHILE! Use about 6 chile anchos. They need to be dry roasted. Wash them good and boil them until soft. I boiled mine for about 20 minutes. After they are boiled through them toss them in the blender with the water. You want to liquefy the chiles so blend them for a good long while. 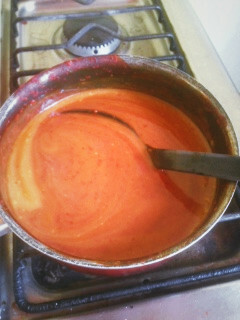 Once they are a smooth liquid strain them and put the remaining in a pot. The heat should be on about medium-low heat. Guess what comes next…chocolate!!! This recipe just gets better and better. Toss about 2 Tablespoons of chocolate into the liquid chile. Constantly stir until the chocolate is completely melted. The next thing you need to mix up is the bread mix. In the blender add 1 tomato, 1/2 an onion, 2 small cloves of garlic, bread (about 2 slices worth), about 6-8 Ritz crackers, and a small amount of a cinnamon stick. WARNING: If you put too much cinnamon, your mole with be disgusting. Seriously so horrible. Take my word for it…In the photo of the cinnamon stick above, do you see the top of the side of my pointer finger? That is ALL you want. Combine all of these items in the blender. Add about 1 1/4 liter of the chicken stock that came from boiling the chicken. This will help it to not be a bread smoothie. Strain the mixture after it is liquified. Add this bread soup into the chile in the pot. Here’s a tip: keep stirring while the mole is on the burner. You do not want ANY curdles in your mole. That’s gross. So stir and take off the burner while you make the bread soup, or you can do as my suegra does and have a helper stir the mole while you get everything else ready. It makes for good family bonding time too! The last spice you want to add to the mole is pepper and gloves. Make sure that they are whole peppercorns and cloves. Use 3 peppers and 2 cloves. Anymore, they will overpower the mole. You want to mash them up. I didn’t have a stone bowl and hammer thing…I have no idea what those are called…but I do have giant rocks around my house. So I took the little bag of solid spice and smashed it like crazy with a rock on our concrete floor. This is a great way to get any extra anger or frustration out! Remember the chicken? 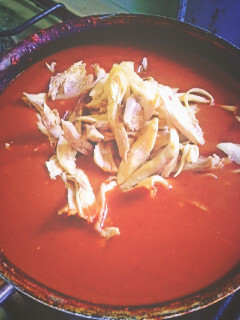 Shred it with those fingers of yours, or a fork, and toss the shredded chicken into the mole. And you’re ready to serve!! What’s mole without tortillas! But also don’t forget the rice! (I did…Luckily there is a real Mexican in our household who will let me know when we are missing something for a traditional meal.) 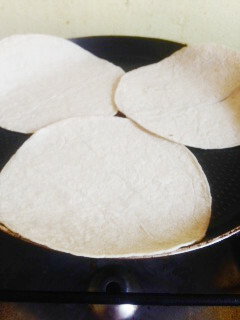 So cook up some rice, put a spoonful in your mole and enjoy with some nice warm tortillas!